SEELE-01 wrote: Revoltechs or Robot Damashii. Robot Damashii IS more screen accurate, but they are more expensive, the line-up does not include Evas past 2.0 and half of them are super expensible, hard-to-come-by limited editions. Revoltechs are a bit cheaper and are re-issued at least once every two years, so there is no shortage of new figures. Now, neither one of those are figures meant for BRRAP BRRAP, PEW PEW. They are collectibles meant for a certain degree of manipulation, but they are by no means toys meant for someone under 15 (physically or mentally). The one big advantage that Revos have over RDs is the fact that there are far more models in the series, and (apart from Unit 05), they are all in scale to each other. Location: On a giant blue ball ! Also, I'm curious, how good are the Banpresto figures ? From what I've seen, they look like cheap versions of RD (which they probably are), and their Mark 06... well, it's like one of those chinese bootlegs that even the advertising can't make look good. 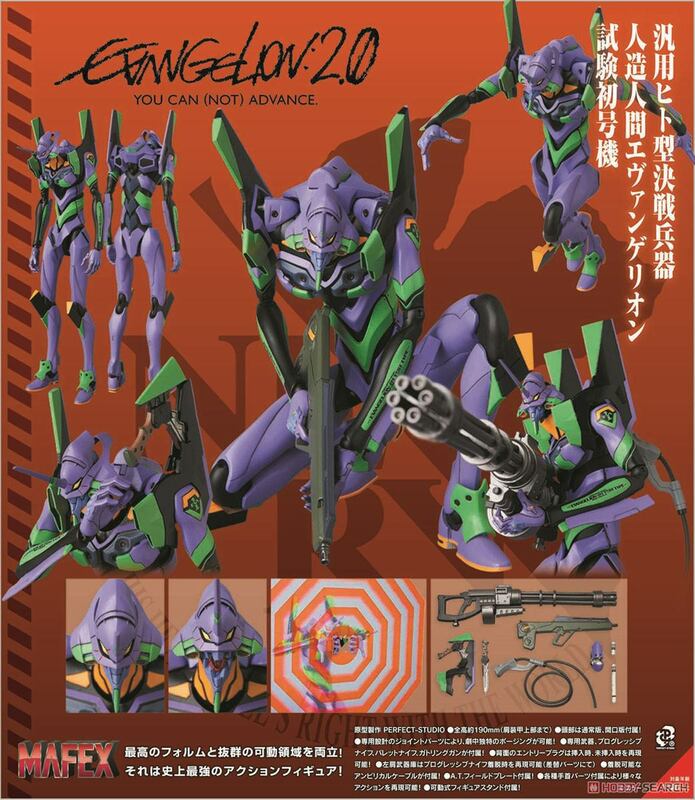 However, their Units 00,01 and 02 looks okay, and apparently Yui-sama has a mouth articulation, which IMO is something way more practical than an alternate head. Nerv is recruiting new employees ! Check the list below to see what are the required competences for each job ! Commander : being as unexpressive as possible and doing a perfect "Gendo pose". Vice Commander : looking constipated. Operations director : shouting orders which have 95% chances of failing. Chief scientist : looking amazed and puzzled when something goes wrong with an Eva. Bridge operator : saying what's going wrong with an Eva and which emergency procedure isn't working. Therapist : thera what ? 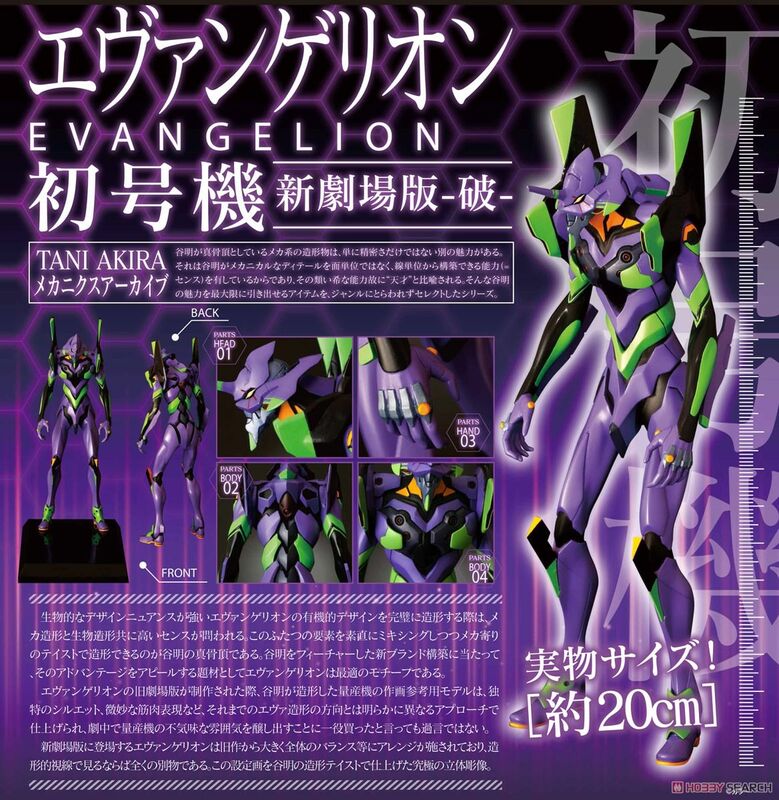 So we're getting two new Eva-01 figures. Whoa, the Medicom one looks absolutely sweet. And for once, it's actually affordable! Define what you mean by "all the designs". They look nice ! Maybe I'll pick the Medicom one, the accessories are cool and... is that a mouth articulation ?! Why so much hate for those Evas? As you can see it's basically like Frame Arms and Frame Arms Girls that Kotobukiya does, but the mecha and girl kits are compatible instead of being separate. Am I the only one that absolutely despises when they put high heels on Evas? SEELE-01 wrote: Am I the only one that absolutely despises when they put high heels on Evas? Fact: High heels are the pinnacle of mecha design. The high heels are at least "cowboy boot" style, and thus the only actually functional kind of high heel I'm aware of. But unless Eva-01 needs to secure her feet in a pair of stirrups -- pretty safe bet that the answer is "no" -- those heels have absolutely no reason to be there. Unless Unit 01 has to ride Unit 02 in beast mode. The heels give a jarringly effete air to the Eva, in my mind. No you're not, IMO it's not very compatible with the menacing feeling that Evas are supposed to have (sorry toy designers, but I can't decently associate a big monster who rips apart and eat Lovecraftian beings and sometimes causes apocalypse with high heels). Hey, maybe that's why Evas went berserk through the whole series, they totally didn't cared about the pilots and were just angry because of their figures with high heels. Oh, and I've got a question for veterans. My Revoltech Mark 06 finally arrived, and it's perfectly fine except for two things. First, the belly rubber piece looks like it's popped out, it looks weird and doesn't fit into the place it's supposed to. I suspect it happenned when I had to remove all those stupid plastic things stuck in the Eva for whatever reason. I'll try to post a picture to make it more clear later. And second, the torso joint simply doesn't move, which is problematic for posing the figure (duh). So, did anyone here had the same problems and know how to fix them ? Besides that: what good is a robot that will break its ankles when trying to run? ZQFMGB wrote: Oh, and I've got a question for veterans. My Revoltech Mark 06 finally arrived, and it's perfectly fine except for two things. As for the stiff torso... What section? The chest-abs joint or the abs-hips joint? Is the stiffness a by-product of the sections being out of place? Yeah, I can imagine the Sahaquiel battle with high heels, especially with the "Destiny" track. In fact, pretty much all battles would've being disastrous (or even more disastrous) with high heels. After several re-assemblings I managed to kinda fix the first issue. Still not perfect, but it doesn't look awful like before. As for the joint, it's the chest-abs section and it doesn't look like the sections are out of place, so I think it's a by-product. ZQFMGB wrote: And second, the torso joint simply doesn't move, which is problematic for posing the figure (duh).